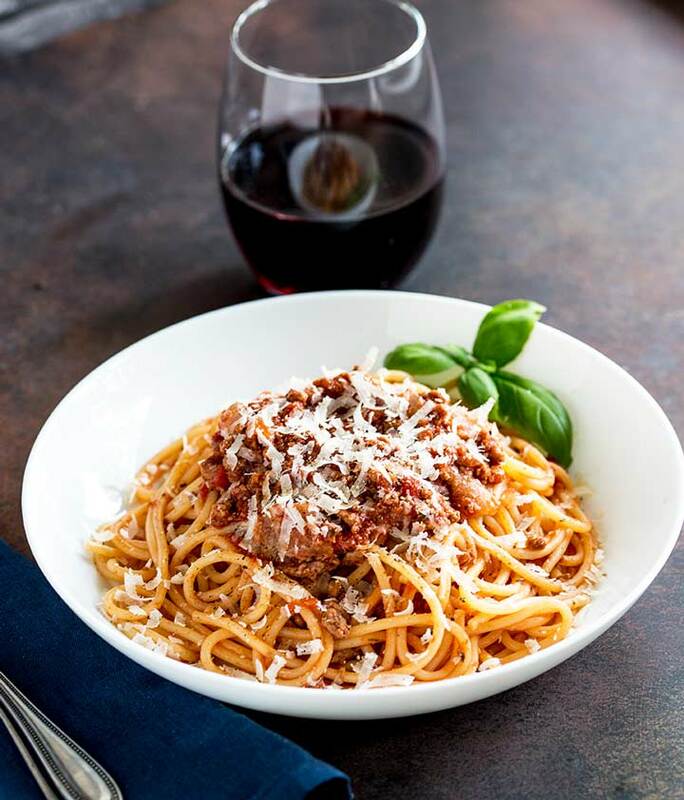 Spaghetti Bolognese is an American Italian classic loved the world over. 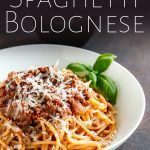 This Authentic Spaghetti Bolognese is cooked long and low to leave you with a rich, deep ragu that is loaded with flavor. 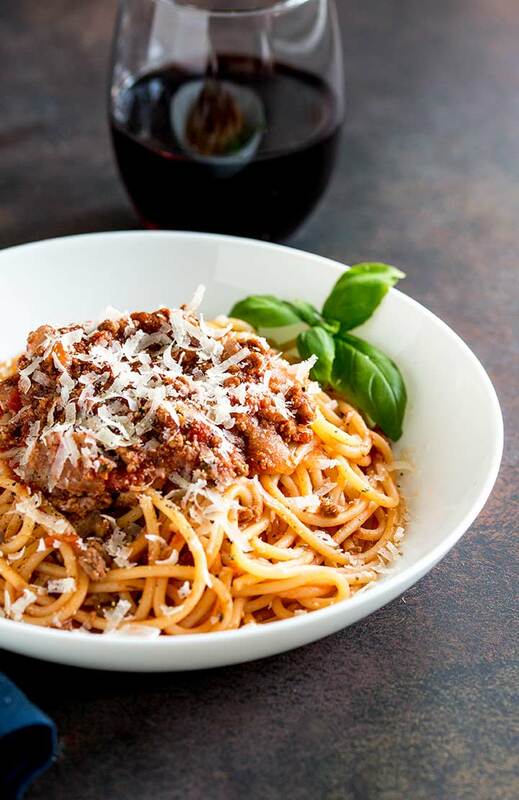 Simply the best recipe for Spaghetti Bolognese – A true classic family favorite. 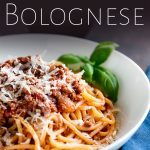 How long to cook bolognese sauce for? 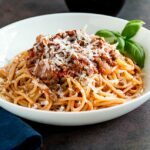 This authentic spaghetti bolognese is a slow cooking dish but it is worth the wait. The key to developing the flavour is to let the sauce cook over a very low heat for 90 minutes. This elongated cooking time, means the dried herbs soften and mellow into the sauce and the onion and garlic melt into the sauce. When you add the ground beef to the onion mixture, make sure you use a spatula or wooden spoon to really break the meat down. This helps it to absorb the flavours and gives the final sauce a melt in the mouth feel. Although the recipe requires you to brown the beef, don’t let it get too crispy as this can affect the texture of the final bolognese sauce. Don’t be alarmed by the addition of sugar. Most canned tomatoes are a little acidic and the sugar helps to enhance the tomato taste and remove any sour notes. If you have read any other recipe here on Sprinkles and Sprouts, you will know that I am a big advocates of using the pasta cooking water to create a thick saucy emulsion. That is vital here. Once the pasta is cooked, add the pasta back to the pan along with some reserved cooking water and half of the bolognese. This is all cooked together to get the sauce into the pasta. It really does make a difference. You can still spoon a big spoonful over the top, but the simple step of cooking the pasta in some of the sauce will make all the difference. How many people will this Authentic Spaghetti Bolognese Serve? Or freeze half for a quick weekday meal. It tastes fabulous after freezing. How to freeze Spaghetti Bolognese. I recommend freezing just the sauce and cooking the amount of pasta you need for your meal. Allow the sauce to cool and then place into labeled pots or ziplock bags. It will keep in the freezer for 3-6 months. Just remove the bolognese from the freezer in the morning and it will be ready to heat up when you get home in the evening. You can heat it up in a microwaveable bowl, or over a low heat on the stovetop. Side: We think this classic spaghetti bolognese is best paired with some sort of bread. Either some warm ciabatta or plenty of garlic bread. Wine: Because of the slow cooking the tomatoes in this dish can take a big bright red wine. Try a Shiraz or a Chianti. Or go more traditional and pair this dish with a wine made with the Nebbiolo grape: a Barolo or Barbaresco. If red isn’t your thing then stay with the regionality of this dish and serve this up with a sparkling Lambrusco, unusual but a great wine pairing. Pin this recipe for Authentic Spaghetti Bolognese. Pin it here. 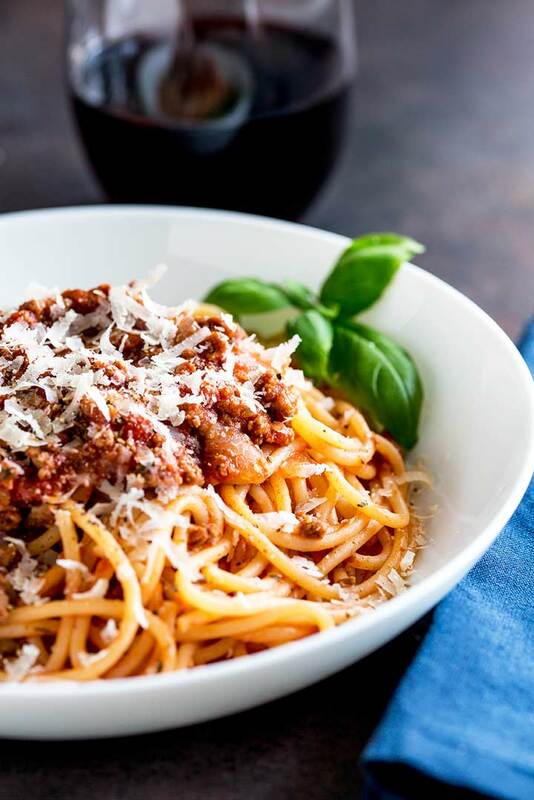 Spaghetti Bolognese is an Italian classic loved the world over. 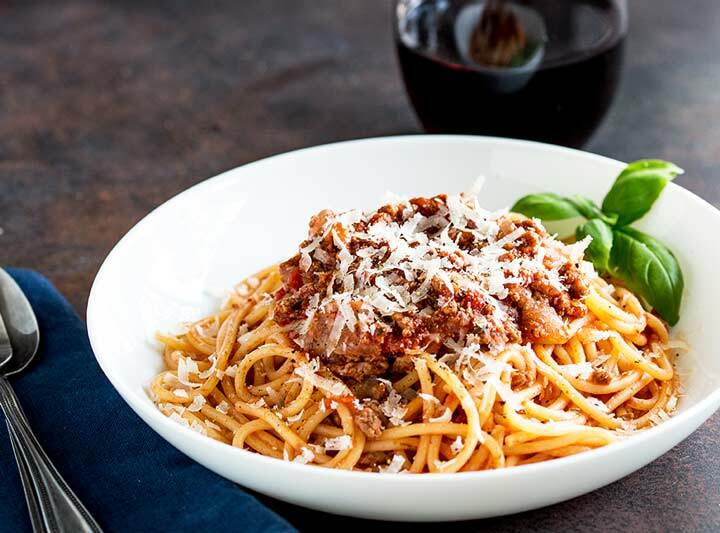 This Authentic Spaghetti Bolognese is cooked long and low to leave you with a rich, deep ragu that is loaded with flavor. 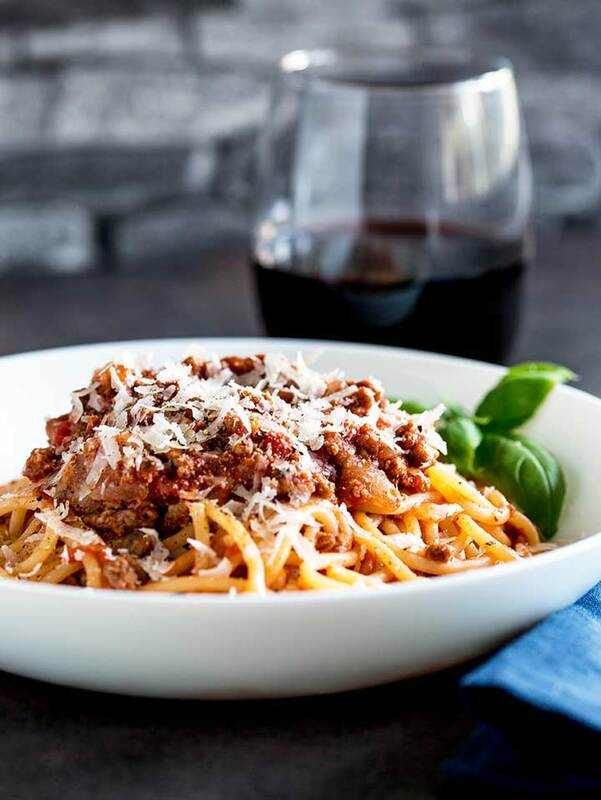 Simply the best recipe for Spaghetti Bolognese – A true classic family favorite. Add onion and cook over a medium heat for 5 minutes and cook until they are softened and lightly golden. Crumble over the beef bouillon cubes and stir well to coat the meat. Peel the garlic and grate or crush it into the mixture. Stir well. Add in the red wine and let it sizzle for a a couple of minutes. Add in the crushed tomatoes, sugar, Worcestershire Sauce, oregano, Italian mixed herbs and water. Stir well and bring the mixture to a simmer. 10. Put the lid on and cook over a very low heat for 1 1/2 hours; stirring occasionally. 11. Once the time is up, increase the heat to medium and cooke without the lid for a further 20 minutes. 12. Taste the sauce and then add extra salt and pepper to taste. 13. At this point you can cook the pasta or cool the sauce and refrigerate it until later. Reserve a cup of the pasta cooking water and then drain the pasta. Place the pasta back into the pan and add the reserved water. Place over a high heat and add half of the bolognese sauce. Stir well until the sauce has thickened around the pasta. Serve the pasta with extra sauce spooned on top. You can use red wine or white wine in this dish. White wine is actually more authentic, but red wine tastes delicious too.